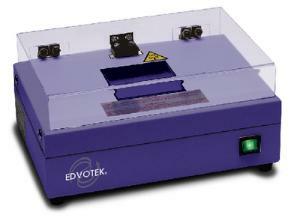 EDVOTEK®'s Midrange UV Transilluminator is designed to visualize DNA stained with either Ethidium bromide or SYBR® Safe. The UV filter measures 7 x 14 cm which is optimized for viewing gels cast from EDVOTEK® electrophoresis chambers. Safety features include a UV blocking cover and an automatic power-cut off when the cover is opened.